Specifications:Size (Dia): M4 upto M16 / 8-32 UpTo 3/8". We are involved in offering a wide gamut of Insert Nut to our clients. Nut Inserts (rivet nuts) which are made of superior grade raw materials. 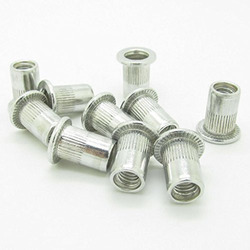 An D Nuts Insert is a fastener element that is inserted into an object to add a threaded hole. Our range of D Nuts Insert is precision made and has wide industrial applications. Made of qualitative grade metals, these are durable and corrosion resistant. These can be customized as per the given specifications and requirements of our customers.